Max Beckmann is generally considered the greatest of the second generation of Expressionists who came of age in the period between the two world wars. Many of these artists had endured horrific experiences on the battlefields during the First World War, and this led them to embrace the nihilism of Dada, political satire and eventually the edgy neo-realism known as Neue Sachlichkeit. Although Beckmann, too, was emotionally scarred by World War I, he remained truer to the tactile brushwork and expressive palette of the earlier Expressionists than many of his contemporaries. Beckmann's work encompasses a broad array of subject matter, from social commentary, conventional portraits and still lifes, to monumental (and often obscure) allegories. Max Beckmann was a contemporary and friend of the founder of the Galerie St. Etienne, Otto Kallir. Kallir published a suite of prints by Beckmann in the 1920s, and the gallery has maintained a connection to the artist's work ever since. Born in Leipzig, Beckmann began his formal art training at sixteen at the Weimar Art School and then studied in Paris and Florence. He returned to Berlin, where he made contact with the art dealer Paul Cassirer in 1907, became the youngest member of the Berlin Secession's governing body in 1910, and received a contract to publish his graphic works in 1911. By 1913, he had had his first solo show at Paul Cassirer's gallery, and the first monograph of his work had been published; respected critics praised his work. In 1915, Beckmann enlisted as a medical orderly in the German army, and the misery and slaughter that he witnessed on the Front caused him to experience a nervous breakdown. His military experience changed his artistic style completely; the romantic technique of the prewar years gave way to a style that employed angular forms and flat colors. His new works were displayed for the first time in 1919 and received an exceptionally positive reception. 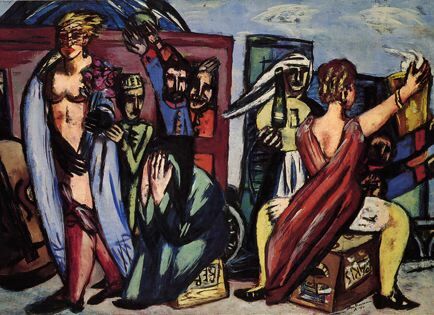 Beckmann reached the height of his popularity from 1924 to 1930, during the Weimar era. At this time a second monograph of his work was compiled and the dealer I.B. Neumann signed him to a three-year contract with a guaranteed income. He was also employed as a master teacher at the Städelschule in Frankfurt and an entire room of the Kronprinzenpalais in Berlin was dedicated to his work. In 1930, he was chosen to represent Germany at the Venice Biennale. His bleak figures captured the imagination of a depressed nation. Beckman felt the effects of National Socialism as soon as Hitler came to power in 1933. He was immediately dismissed from his post at the Städelschule and was vilified by the Nazis as a despised "degenerate" artist. His works were placed in the first room of the "Degenerate Art" exhibition of 1937. The day of the show's opening, he and his wife fled to Amsterdam, where he lived out the war. Beckmann emigrated to the United States in 1947 and took teaching positions in St. Louis and then in Brooklyn. He died in 1950 of a heart attack.